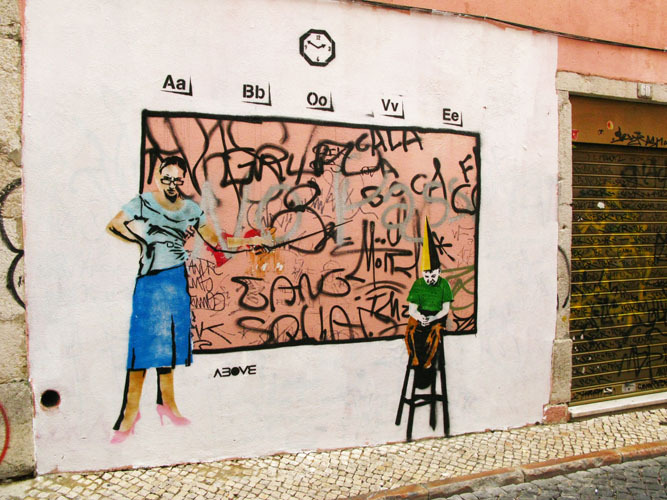 ABOVE, the prolific street artist best known for his wooden arrow mobiles, clever wordplay pieces and most recently, his social and political commentary stencils, has long been putting up work throughout the world that both brings huge smiles and invokes serious contemplation. As long time fans, AM was thrilled to gain further insight into ABOVE’s recent work, thoughts on the economic crisis and his whirlwind journey during his “South Central” tour. To coincide with this interview, ABOVE just released a hand-pulled screen print on his site featuring his “Union Jack Arrows” which were painted in over fourteen countries during his 2005 European Tour. 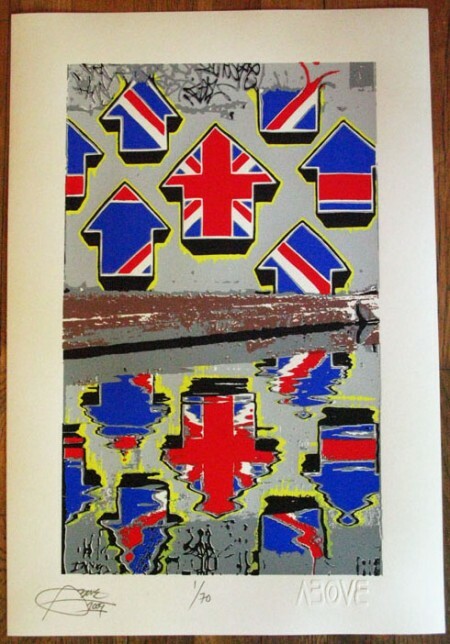 The piece is a great twist on the Union Jack/Union Flag motif remixed in ABOVE’s signature style. 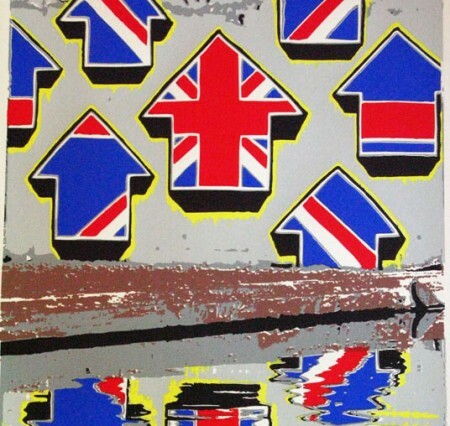 Check out the interview and the details about the “Union Jack Arrows” print after the jump. Edition Size: 70 Regular Edition (Red/Blue) + 20 Special Edition (Orange/Green). Price: Regular Edition = 69.00 GBP, Special Edition = 99.00 GBP. Paper/Ink: 7-Color hand pulled screen print on 22 x 15″ (56 x 38 cm) Lennox 100 Archival White 250 GSM. Every print is custom embossed, signed, dated and numbered by Above. Arrested Motion (AM): 2008 was quite the wild ride for you. At the beginning of the year, you continued traveling through some of the poorest parts of the world and you were robbed for a nominal (in U.S. terms) amount of money and your camera. 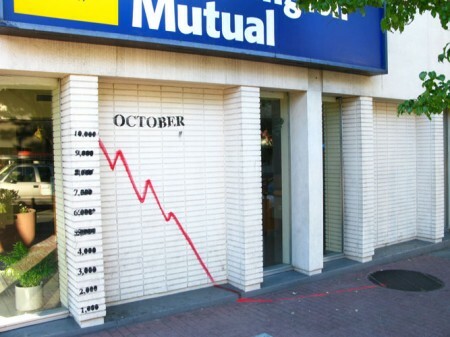 Then you return home to find the nation entrenched in a state of financial collapse. This has obviously inspired the imagery for your pieces “What Goes Up Must Come Down” and “Stealing From The Rich.” Do you feel this correction was actually a good thing? ABOVE: Life is about balance! Having said that I think that the slumping economy is a good reality check for a lot of people. As much as I hate the power of money, it does hold a lot of power. When that power is taken away or stripped from you, you can do a new inventory of what is important or necessary to you in your day to day life. When you own 2 houses and 3 cars you realize that you only need 1 roof and a bike to live happy. It’s natural to have this balance otherwise the scale would be offset. Imagine if we had no summer and just winter. It would be havoc and un-balanced so yeah these times right now are a good reality check and hopefully a time of introspective behavior for people. AM: You donated all of the profits from your “Stealing From the Rich” print to two homeless shelters, a very noble, Robin Hood-esque move, especially needed in the today’s times. What did you gain from this experience and are there plans for any such projects in the near future? ABOVE: I gained everything but money from this experience! The “Stealing from the Rich” stencil piece I made in Lisbon, Portugal in my mind was somewhat taking advantage of the homeless lady in the photo. To a degree I felt like I was exploiting her sitting there with no shoes, home, or money. I think of myself as a pretty down to earth guy so to turn around and make a buck off of this print was not something I was looking for. On the other hand It evoked me to get involved and instead of taking a financial gain from this image/situation It felt only logical and humane to fund-raise and donate the money to 2 selected homeless shelters that I felt have been helping people in such situations out with resources, food and shelter. The response was quite overwhelming as the print edition was quite big (edition of 250) and during a time when the economy was in the shitter. I got many emails from people saying how inspiring it was to see a young (and struggling) artist get involved and donate all the money and spread the love. It feels great to know your helping out and doing your part, so yeah for sure I want to keep doing similar projects that donate money and help others out. 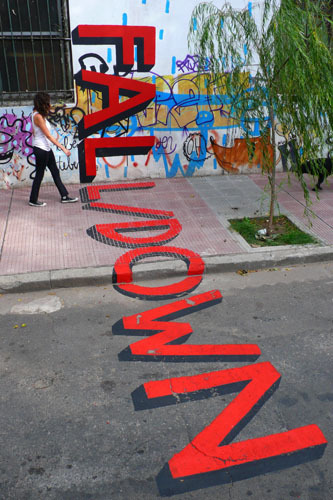 AM: Towards the latter part of 2008, you moved to a style comprised mainly of stencils and figurative imagery. It was refreshing to see stencils that still had a message behind them. What was the root of this change in technique? ABOVE: Honestly It was about half way through the South Central tour that I was ready to take another step forward and evolve into not only text word/play pieces but more universal imagery that could still have an obvious message but in the form of figurative narration. I used to stencil a little here and there back in Paris in 2002 but never to the degree or depth as now. The process and being able to wrap my head around the different techniques and forms is what I like. It’s very challenging and I like that aspect. AM: In “Skool of Hard Knocks” you diss the writers who got up on the wall. 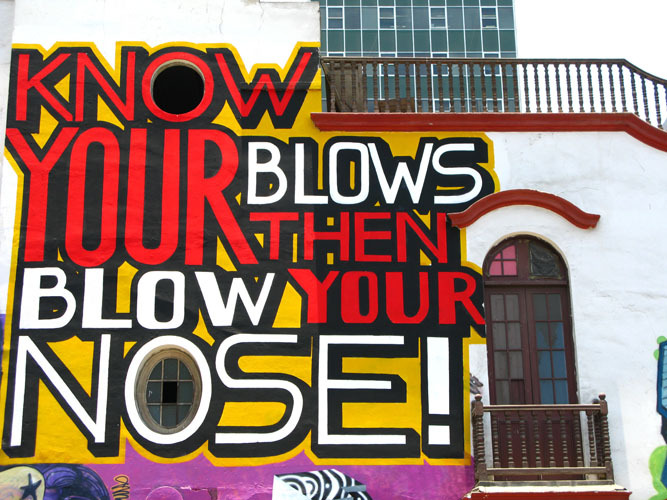 What was your motivation behind this piece being both a street artist and graffiti writer yourself? ABOVE: Really? I thought I was making a statement about how we (graffiti artists) are looked down upon for writing our names on walls! I just updated my new website and this piece is the first in the CUT IT OUT section where I talk about how dating back to cavemen we (humans) have always written and drawn on walls. Even our first experiences in school we are tough to stand up and write on the chalkboard. “The Skool Of Hard Knocks” piece challenged and poked fun at how in society we are blamed and shunned for continuing to write our names in the manner. AM: You describe 2009 as the year of “Bang or Bust.” Can you please elaborate? ABOVE: Well the “Baby New Year” with his traditional blue sash, top hat and diaper asks you the viewer the question. “Will 2009 be a “bang or “bust” year? You have to be living in a cave to not be aware of the global financial situations. Every New Year people are optimistic and introspective setting “resolutions” so this piece was a comment on the financial situation as well as an individuals goals or optimism for the 2009 year. 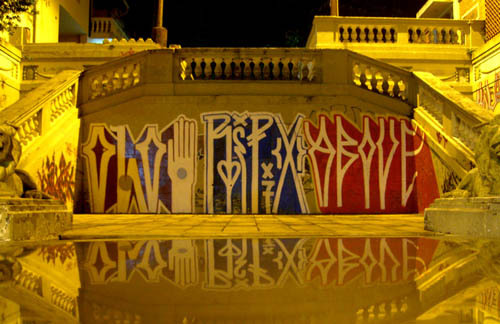 AM: Early-2008 marked the culmination of your South Central tour. How did this tour differ in terms of growth and experience compared to your North American and European tours of years past? 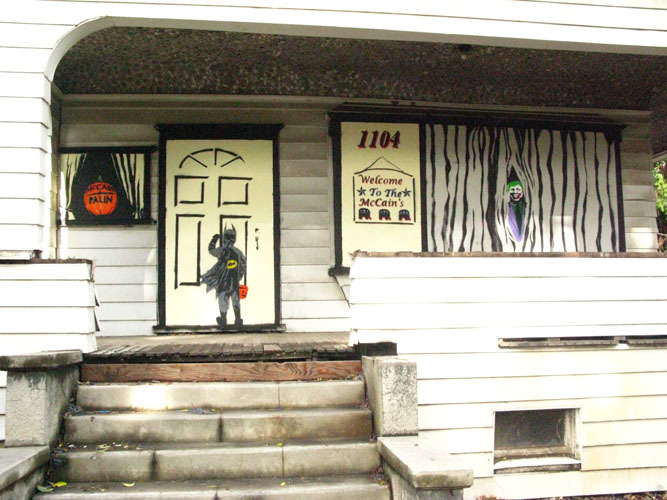 ABOVE: The 6-month long South Central Tour’s goal for me was to paint and expand the former Word/Play done in previous years on the wooden Arrow Mobiles. The 2004 UNITED STATES TOUR, was all about hanging the wooden arrow mobiles in as many high profile spots in cities around the USA. The Word/Play concept at that time was still in it’s infant stages. 2 years later and much thought about how to step up the visual aesthetic of the wooden arrow mobiles and make more of a site specific commentary that the viewer could relate and understand, I went back to Europe for the “SIGN LANGUAGE TOUR.” The SIGN LANGUAGE tour I was an intense 26-country tour around Europe where I improved the visual aesthetic by deciding to glue fabrics, and textiles to the Wooden Arrow mobiles. On each side of the arrow there was a 4-letter word stenciled on it. The “SIGN LANGUAGE” aspect was that when the installed Arrow would spin by the blowing wind, both sides would create a silent “dialog” with the viewer below. During the Sign Language tour I really started to be more interested in installing the Arrow Mobiles in very site specific areas and locations that related to the specific word/play. After the completion of the Sign Language Tour I was seeking how I could expand and have the site specific word/play’s grow and evolve. Fast Forward to October of 2007 where I started the South Central Tour in Rio De Janeiro, Brazil and I was now ready to grow and instead of being confined to space on a Wooden Arrow my aim was now at large wall spaces. If you watch the South Central tour video’s you can see that in the beginning of the tour the word/play’s were like a new born baby learning how to stand up and walk. 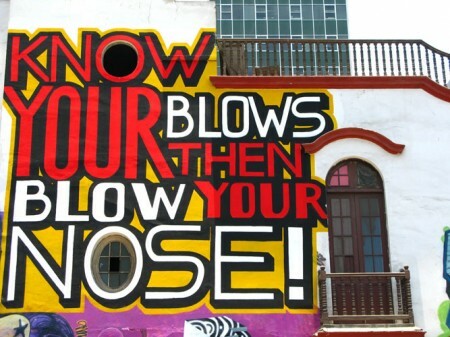 6-months later in Mexico City the Word/play paintings had grown to not just 2 words but whole phrases and commentary. The final main progression from the South Central tour was the fact that everything I did in the streets was large scale paintings. I was able to focus and challenge myself with trying to paint bigger and bigger, cleaner and cleaner. South America has such an old history of large scale murals and public artworks so working in this painting medium I think could of only really succeeded in that part of the world. Maybe…maybe in Europe, but certainly never in the U.S.A.! AM: In terms of imagery during your South Central tour, you reverted back to your graffiti roots and strayed away from painting your signature Arrow and didn’t hang any Arrow Mobiles. Instead, you focused on your Word/Play pieces and getting your name up. What was the reason behind this? ABOVE: It’s a direct reflection of a growth and evolution of my style. 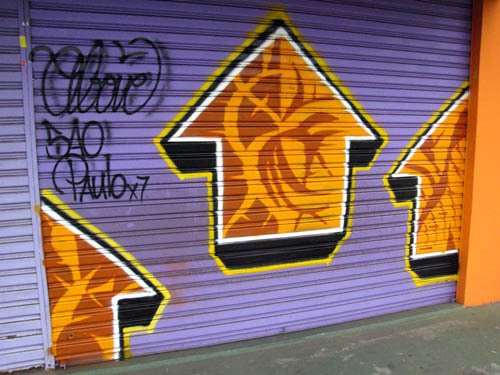 I started the “Arrow” campaign in Paris, France in early 2002. At that time it was fresh and fun to take the word “A-B-O-V-E” and change it to an upward pointing arrow that represented “ABOVE.” Since then it has evolved from making wooden arrows and attaching them to walls, hanging spinning arrow mobiles, to spinning arrow mobiles with fabric, and texts, then the South Central tour took the text concept from the previous tour and ditched the arrow theme. It has always been a progression from there to now, and in the future I only anticipate exploring new mediums and ideas. As I grow older and get exposed to new parts of the world, people, and life experiences and I change because of these experiences. I really enjoy a good challenge, so trying to progress on my weaknesses as an artist is fun to explore and take on. I think only 1 time during the South Central tour I made a painting with the word “Above” in it. I’m at a point right now where I want my artworks to have a dialog and express a range of emotions or commentary be it serious, funny, political..etc to people. I don’t think anyone (Myself included) could really feel much substance or emotion looking at the word “ABOVE” tagged on a wall?! In a similar fashion to the previous arrow mobiles I wanted to simultaneously create a recognizable visual style while creating a dialog. AM: Most graffiti writers take great pride in their unique hometown style. When they get up in other cities, they put their name up in their native style and ensure they rep their city. I found it really interesting that you didn’t do any of this, but instead incorporated the local style of the city/town you were in into your writing so that it fit it with the rest of the scenery. Was this a conscious effort on your part and what were your intentions for doing this? ABOVE: I think you already answered your own question in a way. If Graffiti kid “X” is from city “Y” then of course his surroundings would influence him. Your city, country, atmosphere rubs off on you so it’s not all that strange to think that when I was traveling that all of these factors were taken into account. Like when I was in Sao Paulo the graffiti there is 100% different than anything in Europe or the USA. The letters, approach and mediums are out of this world. When I was there the style of pixacao graffiti influence me a lot at that time because that city is saturated with that particular style. To answer your question, yeah it was a conscious effort for sure. That’s the fun part about doing these large tours is you pick up and leave off styles at the pace you travel. You get to sample and explore so much. It’s like being at a buffet where you can pick and choose what you want for the appetizer, main course, main course again, and dessert. AM: One thing I really enjoyed during the tour was you expanding the length of your Word/Play pieces. The small space on your Arrow Mobiles limited you to utilizing four letter words on either side of the Arrow, but with the wall as a canvas your only limits were your imagination. What was the creative process like when working with longer words and sometimes even full sentences? Since I can remember I was always writing down “catch phrases” or one-liners that I heard. There is something so simple and sweet about a short, but concise statement with as little words as possible. As I mentioned earlier in the interview the Wooden Arrow mobile had only so much space on each side so my dialog was like that of a 4 year old. Very minimal but still communicable. The South Central Tour was like a Teenage years where I could be sarcastic, direct, and just plain crazy if I wanted to be. The Stencil works I am interested on now are like the High school stage where things get more political, and involved with social commentary expressed through human imagery and positioning. AM: What projects do you have lined up in 2009? AM: Haha. We understand that you don’t want to spoil the surprise. Regardless, we’re always excited to see what you come up with next. Thanks for your time. See all of ABOVE’s videos here. Categories: Art, Features, Interviews, Releases, Street & Urban Art, Videos. Tags: Above, Interviews, Releases, Street & Urban Art.